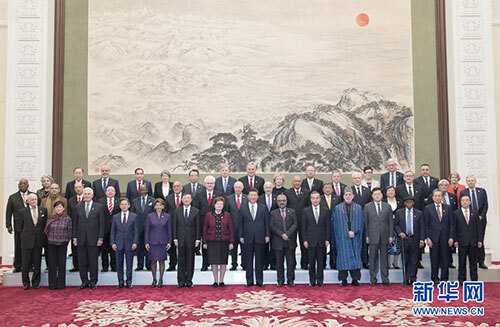 BEIJING, Dec.12,President Xi Jinping reiterated on Wednesday that China will adhere to the path of multilateralism and open its door wider to the world. Xi made the remarks when meeting with foreign delegates attending the just concluded 2018 Imperial Springs International Forum held in Guangzhou, south China's Guangdong Province. He briefed the delegates on achievements of China's reform and opening-up during the past 40 years and important measures of a new round of opening-up at a higher level, expounded on China's relations with the world, and listened to the delegates' remarks. Xi said this year's Imperial Springs International Forum coincides with the 40th anniversary of China's reform and opening-up. The forum, held on Dec. 10 in southern China's Guangzhou, gathered some 200 former world leaders, renowned scholars and business elites to discuss the theme of advancing reform and opening-up, promoting win-win cooperation. "The past 40 years have witnessed tremendous achievements in China's development and remarkable improvement of people's livelihood, from shortage to abundance, from poverty to moderate prosperity," Xi said. China's reform and opening-up drive is people-oriented, Xi stressed, adding that a distinctive feature of the country's economy in the new era is the shift from rapid growth to high-quality development, from quantitative expansion to qualitative growth. "For more balanced and full development, we must further deepen reform and expand opening-up," said the Chinese president. During the Boao Forum for Asia annual conference in April, Xi announced a series of measures to expand the country's opening-up, including substantially easing market access, creating a more attractive investment environment, strengthening intellectual property protection and actively expanding imports. At the opening ceremony of the first China International Import Expo in Shanghai, Xi announced new measures to further expand opening-up. "China will adhere to the path of multilateralism, and open the door wider to the world," Xi said. Saying China's economy has maintained overall stability and steady progress, Xi noted that the goal of "making people well-off" pushes the important potential for the country to achieve further growth. With the increasing income, Chinese people's pursuit of a high-quality life will bring about greater consumer demand, Xi said. "We are firmly confident in the long-term positive fundamentals of China's economic development, as well as in the mid- to high-speed economic growth bringing the economy to a medium-to-high level." Noting that China's role as an active defender and contributor to international rules has been acknowledged by the international community, Xi said China's reform and opening-up is all-round, and the country's development is an opportunity for the whole world. "The practice of China's reform and opening-up has fully proven that only by win-win cooperation can a country achieve long-term development," he said. Xi stressed that the Belt and Road Initiative, which originates from China and belongs to the world, is aimed at building a new platform for win-win cooperation for the international community. He reiterates the principle of extensive consultation, joint contribution and shared benefits in promoting cooperation under the Belt and Road Initiative. "China's overseas investment and cooperation in capacity building and infrastructure construction have driven industrialization of the countries concerned and promoted local people's livelihood and economic and social development," said Xi. Xi said the Chinese side sincerely hopes that all countries will join the Belt and Road partnership and deliver more benefits for all people. He said China's efforts to promote and build a new type of international relations and a community with a shared future for humanity are also aimed at achieving win-win cooperation among all countries. Noting that China's reform and opening-up has left a glorious chapter in history, Xi said the policy will also enable China to score new achievements in the next 40 years that will deeply impress the world. The foreign delegates, including former Latvian President Vaira Vike-Freiberga, said that China's reform and opening-up have brought about tremendous changes in China and had a major positive impact on the world. They advocated developing inter-state ties on the basis of enhancing mutual trust and win-win cooperation, urging all sides to maintain world peace, promote common growth and oppose unilateralism, isolationism and protectionism. The foreign delegates also praised the Belt and Road Initiative, saying it yielded tangible benefits for many countries.